Samudera Pasai Empire is the first Islamic Kingdom in Indonesia. The Kingdom was founded in the 13th century a.d. Nazimudin Al Kamil is the founder of the Kingdom and had the title of Sultan Malik Al Saleh. Ibn Battuta visiting pasai when travelling to China. Ibn Battuta came from Delhi, India. According to him, the Royal Palace, the Palace of the King of india such as pasai. Raja pasai also had the title of sultan. According to Marcopolo, two Sumatran kingdoms, namely the Kingdom of pasai and perlak. the majority of the population is Muslim. After the death of sultan malik al saleh, Sultan muhammad (1297-1326) replace it. Sultan Ahmad was the King Government's biggest Pasai. 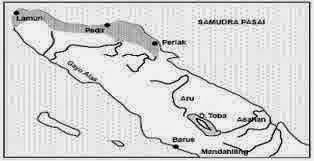 Kingdom of pasai grow quickly and become a centre of trade.Kingdom of pasai had a strong Navy. The Kingdom of Pasai visited merchants from Indian, Arabic, and Chinese. Gold, pepper, and silk is its commodity. 0 Response to "The First Islamic Kingdom in Indonesia"